This 50 year-old lady had her smile rejuvenated with porcelain veneers restoring the 8 upper front teeth and composite bonding to close the spaces in between the lower teeth. The case demonstrates how worn, filled, discoloured or ‘aged’ teeth can be totally rejuvenated with high quality porcelain veneers and/or crowns. 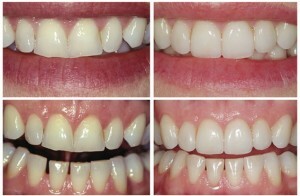 The completed case is shown at a 3 year follow up visit demonstrating the on-going stability and beauty. Note the beautiful yet natural appearance of the restored teeth. For further treatment information see Cosmetic Dentistry.